This weekend I’ll be glued to my 3DS playing through Bravely Second (look for that review next week), but last weekend I completed the first mission pack of StarCraft II: Nova Covert Ops. 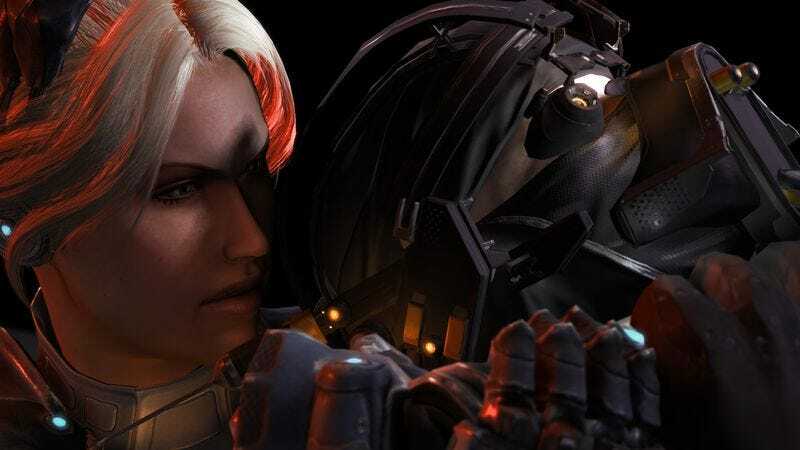 This episodic story puts you in control of Nova Terra, the psychic assassin who was meant to star in Blizzard’s scrapped third-person shooter StarCraft: Ghost and combines stealth with the series’ traditional real-time strategy maps. Unfortunately, it doesn’t do an outstanding job with either half. Set a few years after the events of StarCraft II: Legacy Of The Void, it kicks off with Nova waking up in a lab having lost her recent memories. When a mysterious message on her visor informs her that the lab’s scientists are planning to kill her, she uses her stealth suit to break out. What follows feels very much like the stealth-game tutorial it is, with Nova sneaking around and breaking the necks of guards, taking out anyone with the ability to spot her, and eventually picking up a sniper rifle and grenades for her ranged murder needs. When she breaks out, there’s an on-rails segment where she avoids her pursuers aboard a motorcycle. It culminates in a boss fight against a ship that alternates between shooting a giant laser and carpet-bombing the road. This sequence is the most original thing in the mission pack, which turns into two fairly standard Terran vs. Zerg skirmishes before finishing up with more stealth murder. In battle, Nova acts as a heroic unit like Kerrigan was in StarCraft II: Heart Of The Swarm, accompanying the forces you build with powerful abilities that can be tweaked for your needs. For instance, the second mission sees her ditching the traditional stealth suit for a jetpack so she can run around with the cliff-hopping Reapers you’re encouraged to use to ambush Zerg as they move through the map’s canyons. That sort of customization could prove a boon later in the series—which is expected to release two additional packs of three missions before the end of the year—but here it just reminded me of how bad the Reaper AI is. These expensive units have one job: to stand on higher ground and shoot things that can’t shoot back. But turn your back on them for a second to check on production back at your base, and they’ll jump down into a melee and get themselves eaten or blown up. Between them and the need to keep track of Terra, the level required way more micromanagement than I’d like out of a StarCraft mission. The second mission at least gives you more flexibility when it comes to how you clear out a series of garrisons around a huge map, but you do have to build a bunch of specific units to man them. On the plus side, Nova seems like she could be a fun character. I enjoyed some of the story’s smaller moments, like the barely contained contempt she showed for Emperor Valerian Mengsk and the way she demands the people accusing her of treason hand over a weapon when the Zerg attack their location. I was also just plenty happy to have some fresh single-player content for StarCraft II, even if it only took a few hours to get through. Hopefully Blizzard brings a bit more creativity to the rest of the campaign.